The Child First Advocacy Center staff proudly holds its check for $8,000, granted by Merchants Bank Foundation. 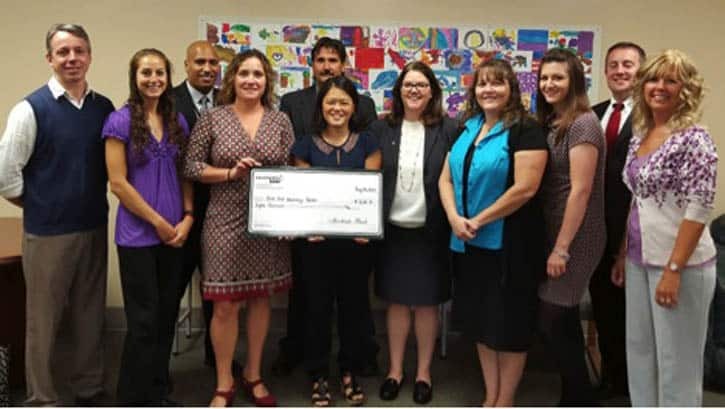 The Merchants Bank Foundation has awarded an $8,000.00 grant to the Child First Advocacy Center (CFAC) to help support victim recovery by providing alternative treatment options and prevention in Rutland County. The Child First Advocacy Center (CFAC) is a fully accredited member of the National Children’s Alliance. CFAC is designed to provide a child-friendly, safe setting to assist victims and their families in the discovery, intervention, treatment and prevention of child sexual and severe physical abuse. CFAC provides the structure of a central agency through which reports of suspected child abuse cases can be channeled for investigation and victim recovery. Employing a joint investigative approach, the Child First Advocacy Center teams law enforcement, the Department of Children and Families, the Rutland County State’s Attorney’s Office, victim advocate services and medical and mental health professionals. Additionally, RUSI (Rutland County’s Special Investigation Unit) is co-located with and coordinates with the CFAC team. RUSI’s primary responsibilities include investigation, prosecution and victim services for crimes involving sexual assault/abuse and other serious crimes against residents of Rutland County. Approximately 90 percent of children are abused by someone they know and trust. This means fewer than 10 percent of children are abused by strangers. Child sexual abuse has devastating long-term effects: excessive drug and alcohol use, suicide attempts, eating disorders, teen pregnancies, and more chronic health problems as adults. The Merchants Bank Foundation, established by Merchants Bank as a non-profit, donates money to charities that serve the communities of Vermont. The funding awarded by the Merchants Bank Foundation will help provide community awareness and prevention efforts along with alternative forms of treatment to help support recovery. For more information about CFAC, visit childfirstadvocacycenter.org.